​A vital part of our mission to help the families in our community move forward to a healthy life that does not include scavenging at the dump includes initiatives designed to increase their health & well being as well as their educational status and understanding of opportunities available to them. We strive to engage our community members in as many ways as possible with the great community at large to make them comfortable with their new roles as members of an urban community and to illustrate to them that their lives mean something to the fabric of the greater Mongolian culture. 60 children from families up at the dump. - In 2016 we reached over 300 children. Our annual Children's Day is a very important holiday in Mongolia and is a chance for families to celebrate the joy that children bring to them. It was a crazy amazing day full of lots of fun, games, songs and laughter! With the temperatures soaring into the low 30's it was also very challenging to keep everyone well hydrated and safe. Everyone who came went away with a goody bag full of fruit, juice, books, toys AND had a hot, nutritious meal - our cooks did an amazing job of putting together takeaway meals of Khoshuur and salad for not only the children, but all of the families who attended as well - this turned out to be in excess of 1500 meals! This community celebration is becoming an "event" they tell me, and next year we should expect 800 children.....wow! 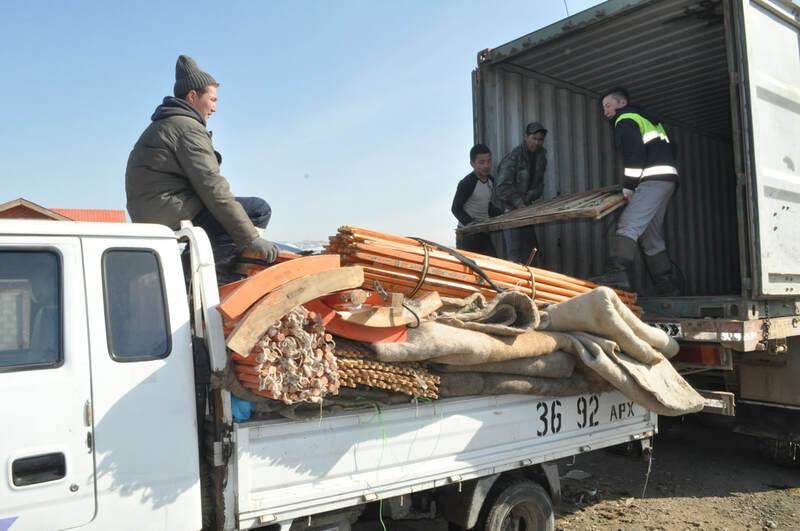 Donations of flour, rice, pasta, tea, salt, sugar, vegetable oil, milk, candy, white nuts, raisins, aaruul, mayonnaise, pickles, biscuits, boov, and tinned fruit are being collected.Veloo Foundation and Starchase Automotive Limited LLC, official dealer for Porsche, Audi and Bentley are coming together and organizing Tsagaan Sar Food Drive 2018 once more! At last years' food drive we helped many families. 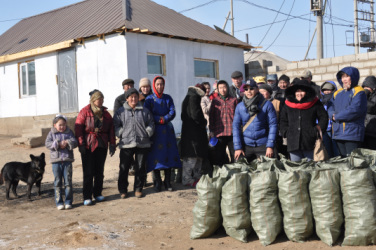 In 2017 alone we delivered Tsagaan Sar food hampers to 120 families from the Ulaanchuluut Garbage Dump. Together we were able to help 120 disadvantaged families to have a joyful Holiday Celebration. In conjunction with the American School of Ulaanbaatar. 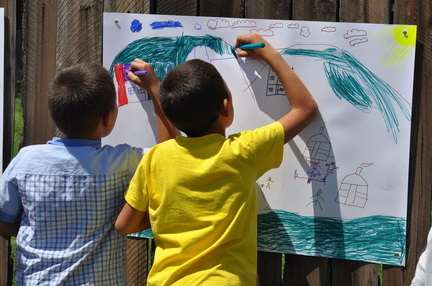 In 2013 the local English Language high school (ASU) which is mostly populated with Mongolian children from wealthy families, took a serious stand to give their children a chance to develop social consciousness. They contacted us, and, together we hosted a number of events. This was one. The school put together hampers of staples for the poor and elderly in our Sanctuary neighbourhood and raised money to buy coal so that each family could have a warm holiday season complete with food for their bellies. It was lovely to see the students really interact with their impoverished neighbours and begin to realize that they could make a difference in the future of their own country by helping their less fortunate neighbours. It has become an annual Event that is now involving many schools and companies. Thanks to the amazing generosity of one woman, Anujin a staunch supporter of our foundation, over 100 children had brand new clothes for Tsagaan Sar. For many of these children this was their very first brand new outfit and thus very exciting! Anujin had thought a few years ago to open a high end children's clothing store , but as happens sometimes in life, the plans for the store never got off the ground and she ended up with a container full of brand new clothes. In an act of generosity she decided to distribute these new clothes to the neediest children from our community. She and her uncle came up to see the joy on the children's faces when they received their gifts. Thank you Anujin for making so many childrens' Tsagaan Sar a wonderful one! From Left to Right - Muugii ( Kindergarten Chief), one of the parents, Julie Veloo , Anujin's Uncle, Anujin ( our so generous donor!) Baskaa ( Veloo Foundation Local NGO partner and Chairman of the Board for the Kindergarten) Shinee ( Willing Volunteer) and Chelvan Veloo - President of Veloo Foundation. ​It was "Community to the rescue!!" We called up parents and siblings of children at the kindergarten, neighbours, friends and colleagues. And everyone came. Because everyone wanted to be part of helping people who needed help. With almost no notice and in the crisp February air (read..blasted cold!!) they worked. Packing and carrying and sorting and sharing. No small job. At the end of it, we were very happy and honoured to have been a part of it and were VERY happy that we had at least Veloo Foundation hats to share with the crew who so valiantly stepped up to help us make the whole ger distribution work. This was a wonderful initiative undertaken by ASU guidance counselor and teacher, Canadian Robert Hotlet. He approached us about giving the ASU students an opportunity to see how the other half live. Literally. 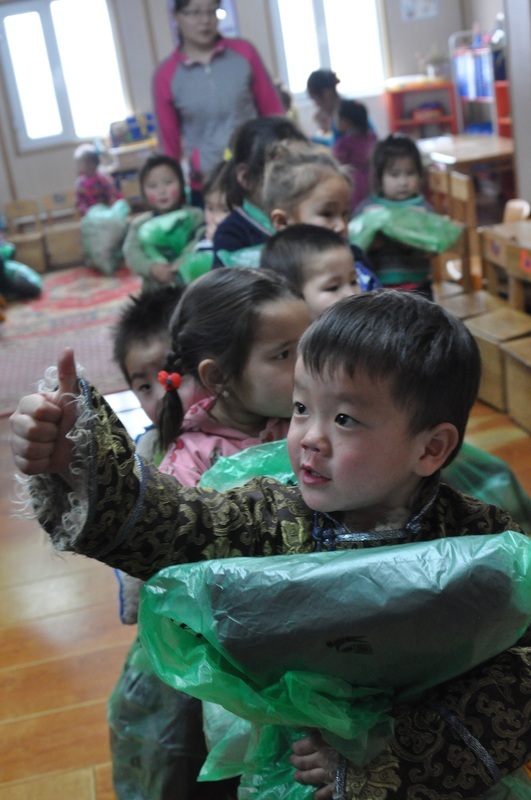 Most of the children, even though they are almost all Mongolian from UB had never been to the ger districts where the majority of urban Mongolians live. It was an eye opener for them. They were very nervous at first, but very soon realized that the kids are, in fact, just kids and if you play with them they will play with you. The most touching thing of all was going back to the classroom a week later and having one student (in grade 12) with tears in his eyes tell us that the visit had completely changed his future and how he would approach his chosen career as a politician. We look forward to working with this school in the future. 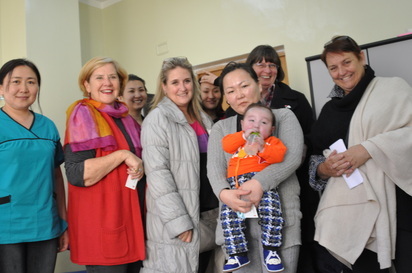 Early in 2013, we were informed about a little 11 month old Mongolian boy named Anand who, without immediate lifesaving heart surgery would die. He had been diagnosed at 28 days old, and his mother had been trying valiantly ever since to find a way to get him treatment. The problem? The heart surgery is not available in Mongolia and he kept being denied by groups who thought his problem was too complicated, that the risk of his not surviving was too great. We heard about him, and that he needed to be sent overseas within a few weeks or his life would be over – likely before his first birthday. Julie and Jacob Veloo found out about it on a Tuesday. A meeting at the hospital with Anand, his mom and the head of Cardiology and representatives from two other Mongolian NGO’s was quickly arranged for Wednesday and, with the assurance from the doctor that Anand was still strong enough to survive the very complicated surgery and the assistance of the MedPro Vision who had everything arranged for him to have the surgery in India and in cooperation with International Women’s Association of Mongolia and a number of private donors, Veloo Foundation ensured that Anand was sent to India. He left on the Saturday and underwent surgery on Tuesday. His surgery was a complete success and he returned happy and healthy to Mongolia where he now lives in Hintee with his parents. Oh, and he just had his second birthday!